"There's just a few rules that you have to remember. One, you're the dominant species. You must never ever treat them as equals. Two, don't ever let anything escalate. Always forgive them. Whatever they do. Three, don't get involved in their squabbles. They sort them out. And four, there's some turds in the hall. Can you clean them up?" What is with our fascination with primates? Is it because they are so much like us, yet so different? Ever since King Kong first climbed the Empire State Building clutching his object of affection, Fay Wray, moviegoers have been treated to a wide variety of apes, chimps, and other primates, as characters that ranged from lovable (Bonzo Goes To Washington), to dangerous (Congo), to smart (Project X), to superior (Planet Of The Apes). I will refrain from making a joke about the pre-fab music group The Monkees only because I can't think of one right now. 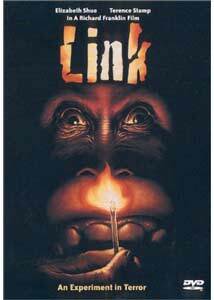 Link is yet another "monkey" movie, and not a completely bad one, at that. In 1986, Link was released and suffered from poor distribution by Cannon Films, whose primary stable of titles featured such action icons as Charles Bronson and Chuck Norris. The film opened around the country in a slipshod pattern, and Link didn't even open in New York City until AFTER it's arrival on home video. It almost goes without saying that movie audiences were never given ample opportunity to see Link, and it quickly became lost in the ever growing sea of VHS titles. Now that Anchor Bay has reissued Link on DVD, more film fans will have the chance to seek this one out. Dr. Steven Phillip (Terence Stamp) is an eccentric Zoology professor in London, and he lives in a huge estate in the remote English countryside with two chimpanzees and an orangutan. The two chimps, Imp and Voodoo, have been taught by Phillip to communicate using a computer keyboard, similar to the real-life experiments with KoKo the gorilla. The orangutan, Link, who is a former circus performer, serves as Phillips butler, and also uses the keyboard to "speak." A young, pre-Adventures In Babysitting Elizabeth Shue is Jane Chase, an American grad student who accepts an offer from Phillips to work with him at his isolated home to aid in his study of the chimps, as well as to do a little cooking and cleaning for him. Soon after her arrival at Phillip's estate, Jane overhears the professor conducting what sounds like a shady business deal on the telephone. It is not long before one of the chimps is found dead, the professor disappears and Jane finds herself fighting for her life against the suddenly violent Link. At this point, Link becomes a variation on the woman-in-peril genre, with Jane being chased and hunted by a crazed orangutan. True to movie form, the phone lines are down, and there are no cars for escape. Otherwise, it would be a relatively short film. Director Richard Franklin, coming off the minor successes of Psycho II and Cloak & Dagger, works the film in a very low-key fashion, and takes his time developing suspense. By the time Link's explosive, somewhat far-fetched, final thirty minutes occur, Franklin has led the audience slowly along, building tension layer by layer. The script by Lee Zlotoff and Tom Ackerman, a couple of television writers, avoid painting Imp, Voodoo and Link as simply cute, hairy little humans. They are wild animals, albeit with occasional human-like qualities, with violent tendencies and incredible strength. One of the things this re-release of Link has in it's favor is the star power of Elizabeth Shue (Leaving Las Vegas) and Terence Stamp (The Limey), who both have achieved more mainstream success in the years following 1986. As expected, both turn in solid performances here, and manage to get beyond that old adage about not appearing in a film with kids or animals. True, Imp, Voodoo and Link drive the plot, but it is the believable actions and dialogue of Jane and Dr. Phillips that connect the viewer. This is not a great film, but it does have some good moments. More good than bad, actually. Link held my interest (and would have WITHOUT the Elizabeth Shue shower scene), and I didn't really have to suspend too much belief until it's climax. Shame on Anchor Bay for utilizing an image on the back cover of the DVD case that reveal the film's ending, despite being foreshadowed extensively. Image Transfer Review: Anchor Bay has released Link in an anamorphic 1.66:1 aspect ratio. The overall transfer is plagued throughout by excessive grain issues and sporadic flicker, which may not be too unusual considering this film is from 1986. When the grain and flicker are not present, Link still looks a bit washed out at times, with a generally muted color palette. Flesh tones remain consistent, though lack any real depth. Black levels have adequate depth, without appearing muddy. A so-so transfer from Anchor Bay, who apparently did not have the most pristine source material to work from. Audio Transfer Review: A 2.0 surround mix is the sole audio option offered by Anchor Bay for this title. Link was originally released in 1986, as with other lower bugdet films of that era re-released on DVD, the audio track is relatively flat. While not mastered as an intended audio showcase disc, it does provide a fairly decent sound field, with music cues being used as the primary source of rear channel effects, with very minimal ambient sounds. It should be noted that Link's score was composed by the legendary Jerry Goldsmith (The Mummy, The 13th Warrior, Oscar®-winner The Omen), and as his style, it is highly memorable and unique. The only detriment is the slightly dated use of synthesizers in addition to strings. If the score was to be redone, minus the synths, it could provide Link a more timeless feel. Extras Review: Anchor Bay skimped on the extras for Link, opting only for a theatrical trailer and teaser. Two pages of production notes provide some general background on Link's use of live animals, and only whet my appetite for more info. An older, lesser known DVD title like Link could have been helped significantly by some type of featurette or director commentary. Link takes the thriller concept and inserts an orangutan as the villain. The end result is film that mixes humor and suspense into a fairly unique viewing experience, at the very least. A strong performance by a young Elizabeth Shue is another plus. Not a perfect film, but one that might work as a rental if you're in the mood for a crazed primate. The lack of any substantial supplemental material on the DVD, and a $24.98 list, does not make this disc a required purchase.